In 1831, young Irishman Charles Adare (Peter Cousens, Return to Eden) arrives in Australia to make his fortune. Swept into the private world of a wealthy land baron and his mentally unbalanced wife, he finds secrets that won't stay buried. An engrossing saga in the tradition of Rebecca, filmed on location with lavish period detail. With John Hallam (The Pallisers) and Lisa Harrow (Kavanaugh, Q.C.) 2 episodes, 2 DVDs, 3 1/2 hrs, SDH. Mature audiences. Charles Adare arrives in New South Wales from Ireland, eager to make his fortune. He's tempted into a land scheme with the wealthy Sam Flusky, whose alcoholic wife, Henrietta, hails from the same hometown as Charles. Adare accepts Sam's request to try to help Henrietta, but his efforts are met with disdain by their domineering housekeeper, Milly. Milly tries to stir up trouble between Sam and Lady Henrietta, but he remains unmoved. Charles escorts Henrietta to a town ball, where she dazzles the local gentry and he becomes smitten by a mysterious young beauty. 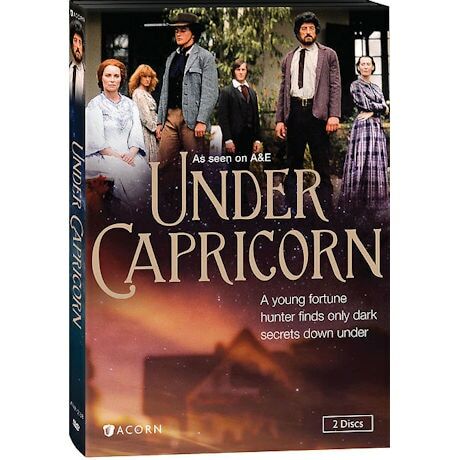 Charles may put his chance for happiness at risk, however, when he hears about the discovery of gold in the outback. With no word from Charles for months, Henrietta has nightmares about his fate in the Australian wild and returns to the bottle. Milly is rehired and resumes her harsh oversight of the house. Henrietta finds Susan, the young girl Charles had fallen for at the ball, and invites her to be her companion at the house. Although Sam has learned that Charles is not dead, he declines to tell his depressed wife. Milly continues to ingratiate herself into her master's life and torments Henrietta in secret. When Susan arrives at the house, she quickly exposes the housekeeper's cruelty. Charles's surprise return prompts a frank discussion between Sam and Henrietta.